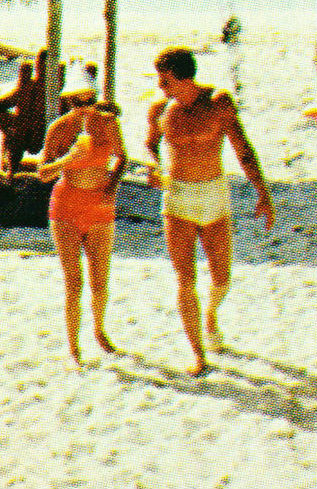 Papergreat: Weekend postcards: Who's going to the beach this summer? If you're going by the solstice1, it's not summer until later this week. But, clearly, summertime is here, as Mungo Jerry would certainly agree. Are you hitting the beach this summer? If so, where? No bridge players here. Condo is lovely. Above: This unusually shaped postcard features Riviera dei Fiori ("The Flowers' Coast") in Diano Marina, Italy. Riviera dei Fiori is part of the greater Italian Riviera. Its name comes from the important flower-growing industry centered within Sanremo and Ventimiglia. 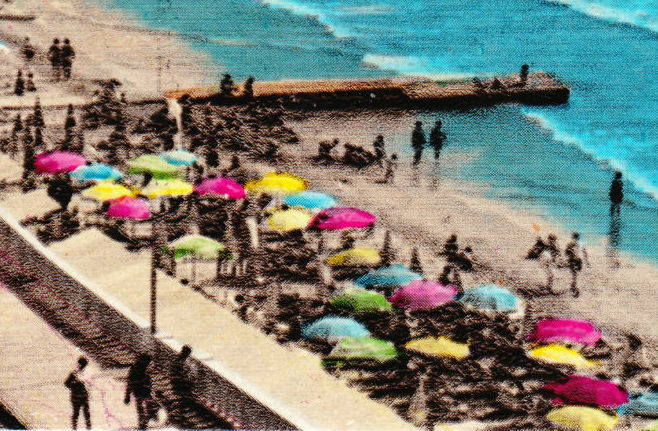 The postcard was published by Millecolor Omniafoto Torino. 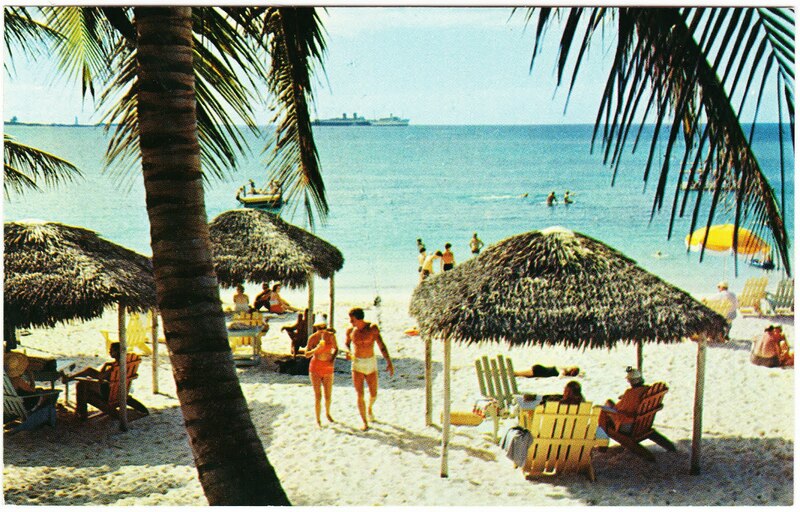 Above: This postcard shows Paradise Beach, on Paradise Island3 in the Bahamas. Paradise Island is now home to the ridiculously lavish Atlantis Paradise Island resort and waterpark, which opened in 1998. The postcard was printed by Transcolor Corp. of New York. Majorca has been a major tourist destination since the 1950s. In addition to its beach, Porto Cristo sports a pair of caves -- Coves del Drach and Coves dels Hams -- that draw tourists. If I could take the family to any of these four beaches this summer, I think it would be this one. 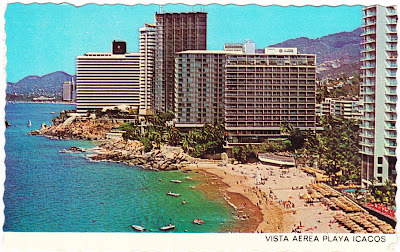 The credit line for this postcard states: "Fotografias de A. CAMPAÑÁ y J. PUIG-FERRÁN - Color directo de EKTACHROME"
1. Joan and I got into a heated debate about this. I think we need a better definition of summer. One that includes all of June. If President Obama or Mr. Romney wants to make this a plank in his campaign, there's an opportunity to win my vote. 2. Acapulco is nearly due west of Monte Albán. But there's no easy way to get there by car. The fastest route, which takes you north, then east, then south, is 500 miles long and takes more than nine hours. 3. Amusingly, Paradise Island was known as Hog Island until 1959. 4. 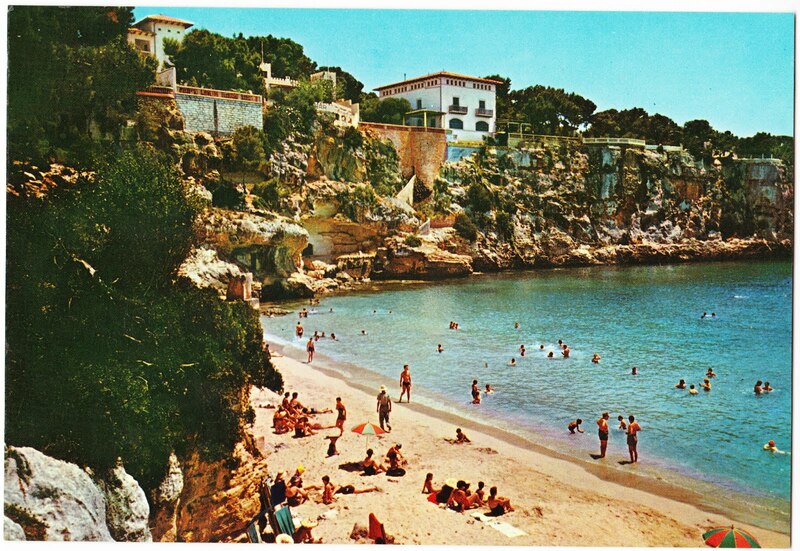 Majorca (also known as Mallorca, as it was labeled on this postcard) is one of the Balearic Islands. The islands are an autonomous community and a province of Spain. 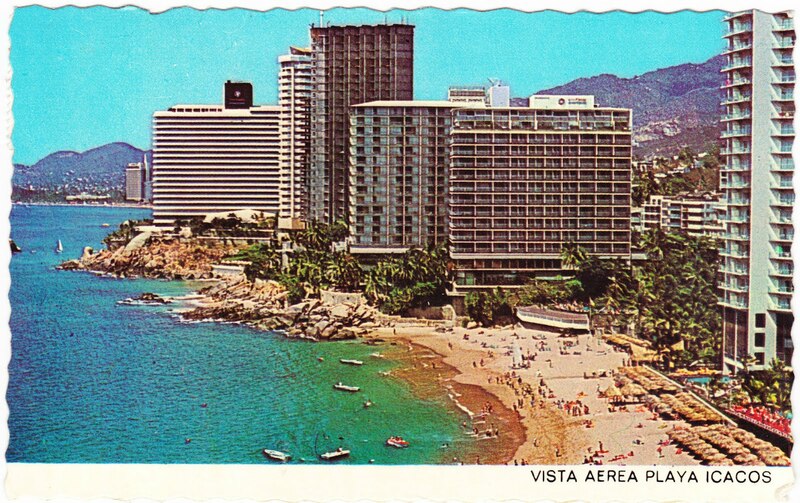 Hi Chris, I'd like to get permission to use the image of the Porto Cristo postcard for an album cover. Could you give me your email address so I can explain what it's for?